The San Francisco 49ers started the season 1-10, but a quarterback switch to trade acquisition Jimmy Garoppolo led to a hot streak, with the team winning each of its last five games to finish 6-10 after a 34-13 win over the Los Angeles Rams Sunday. Garoppolo threw for two touchdowns, and RB Carlos Hyde ran for two more, as the 49ers beat a Rams team that wasn’t playing for much Sunday, sitting most of the team’s key players to get ready for the first round of the playoffs. It was a shaky start for Mannion in his first start of the season but he showed some promise as the game progressed and settled down in terms of accuracy. He hit two excellent passes late in the second quarter, firstly hitting Pharoh Cooper down the seam for a 26-yard gain on third down, following it up with a pinpoint deep ball to Mike Thomas to setup a last gap field goal. There were more misses than good throws but some of the throws Mannion hit were exceptional. Quality performances were thin on the ground for a backup-laden Rams’ offense but their one remaining starter on the offensive line showed his quality. Brown gave up very little in either run or pass games, while his linemates struggled to contain the 49ers’ penetration. Brown surrendered 0 pressures for the third time this season and the first time since Week 7. Peterson’s 61 snaps in this game more than doubled his career total to date and what a stunning game he came up with. Targeted five times, Peterson allowed only one catch for 14 yards while breaking up three passes and intercepting two. Peterson will be relegated back to the bench when Trumaine Johnson returns for the playoffs but a display like this shouldn’t be quickly forgotten when it comes to future playing time. While fellow starter Cory Litteton struggled to coral George Kittle in coverage, Hager had a stronger display, especially in the tackling department where he had 0 missed tackles compared to Littleton’s three. Hager capped off his solid display by picking up a forced fumble and recovery in garbage time, ripping the ball away from Carlos Hyde for another Rams turnover. It was another big game from Garoppolo, as he finishes the season still undefeated as a starter in the NFL. This wasn’t a flawless display, but once again it wasn’t far off without holding him to the standards of perfection. His first interception was poor but his overall accuracy and anticipation against the blitz in particular was on full display once again. Garoppolo went 10-for-13 for 144 yards and a touchdown against the blitz. He ends his first season with the 49ers with a passer rating of 97.9 against the blitz. Kittle was a run-after-the-catch monster for the 49ers, especially in the first half. He forced four missed tackles against the Rams, matching his season total entering the game, and racked up 78 yards after the catch, more than in his last eight games combined. The 49ers are riding a lot of momentum into the offseason and a big game from Kittle, even against backups, will only add to the sense of anticipation in San Francisco as the season draws to a close. 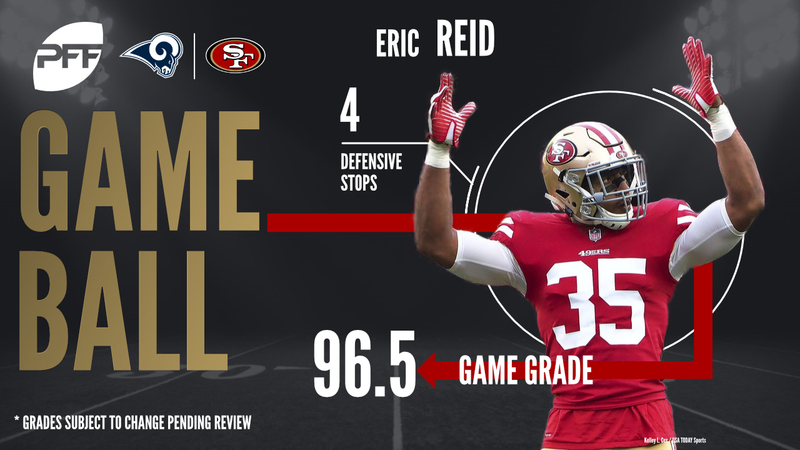 Four stops for Reid against the Rams saw him tie his season-high, set against the Seahawks in Week 2. Reid spent a lot of time playing in the flats and against a conservative Rams’ offense, especially early in the game, he had ample opportunities to boost his production. He did just that and caps of a season that afforded him more opportunity to play closer to the line of scrimmage than in recent seasons, even playing some linebacker when the 49ers were particularly thin, and as a result he finished the season with a career-high 26 stops, 9 more than the 17 he recorded in his 19-game rookie season. Marsh’s biggest play of the game saw him engage in a race to the quarterback with DeForest Buckner which he just won as Sean Mannion wound to throw. That sack saw Marsh pick up multiple pressures for the fourth straight game and was his first sack since the 49ers started their winning streak against Chicago in Week 13.